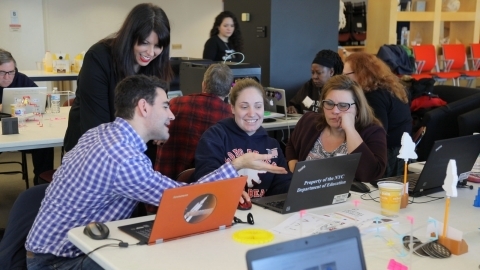 Educators train to become 3D printing experts, then get one-of-a-kind training to develop their own 3D printing lesson plans and curriculum. BROOKLYN, N.Y.--(BUSINESS WIRE)--MakerBot, the industry leader in 3D printing for education, found in over 7,000 schools, is thrilled to launch the most comprehensive 3D printing certification program for educators—available now. Not only does the MakerBot Certification™ Program train educators on operating MakerBot 3D printers, it’s the first program to actually train educators on how to create their own 3D printing curriculum. 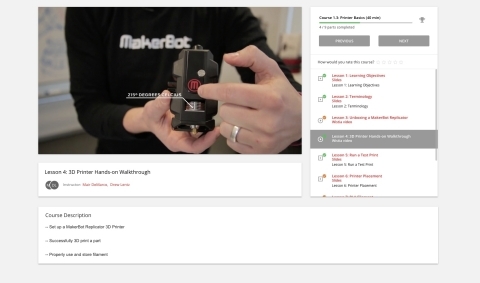 By giving educators the skills to transform typical curriculum into 21st century STEAM projects, then by giving them a portal to share and discover more on Thingiverse Education, MakerBot offers industry leading content that’s the lifeblood of the growing 3D printing community. MakerBot, a subsidiary of Stratasys Ltd. (Nasdaq:SSYS), is a global leader in the 3D printing industry, offers reliable and easy-to-use 3D printing, and runs Thingiverse, the world’s largest 3D printing file library and community. We believe there's an innovator in everyone, so we make the 3D printing tools that make your ideas matter. Discover innovation with MakerBot 3D printing.